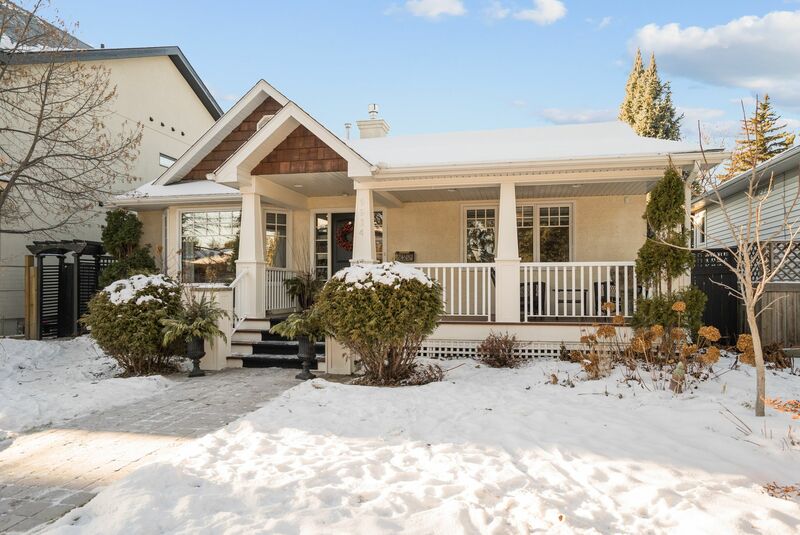 Unbelievable Crestwood Executive-Style Bungalow; Professionally UPGRADED! This Well-Appointed, Stunning Home located along one of the finest streets in Edmonton's most sought after neighbourhood-Crestwood-steps away from MacKinnon Ravine Park will be sure to impress. You'll love the great curb appeal & covered front porch / veranda upon walking up to this fine home & will be blown away by the tastefully redone modern décor inside. The main features an open front entranceway into the living room w/2-sided, stone-surround fireplace into the dining room; spacious family room area; stunning open-concept chef's kitchen w/situp island, 2-tone quartz c-tops, subway tile b-splash, & upgraded SS app's; rear den / desk area & boot room; & lovely master bedroom w/6-piece en suite spa leading into the jack n Jill laundry room! The basement features: 2 bedrooms; 2 full baths; 2 dens; & 2nd family room w/NG FP. HW, tile flooring & upgraded plumbing & lighting fixtures throughout & 3-car heated garage w/loft as well!